The official launch of beta-testing is not until Friday, but I know some of you have your journals now and are probably eager to get started. After the first week, I’ll be sending email only once a week on Friday (I don’t want to overwhelm you with email!) But I’ll be sending a few more this first week so those who want to can get started. In this post, I’ll give you some simple ideas for personalizing the cover of your journal. I’ll be sharing a few more in a later post. But don’t be limited by what you read here! If you have experience with sewing, bookbinding, leather working or other crafts, you may already have ideas for a making lovely cover for your journal. You might make a removable cover, so you can change it later or refill it with a new blank journal or sketchbook. I like to decorate the cover of each journal differently, so I can tell them apart. 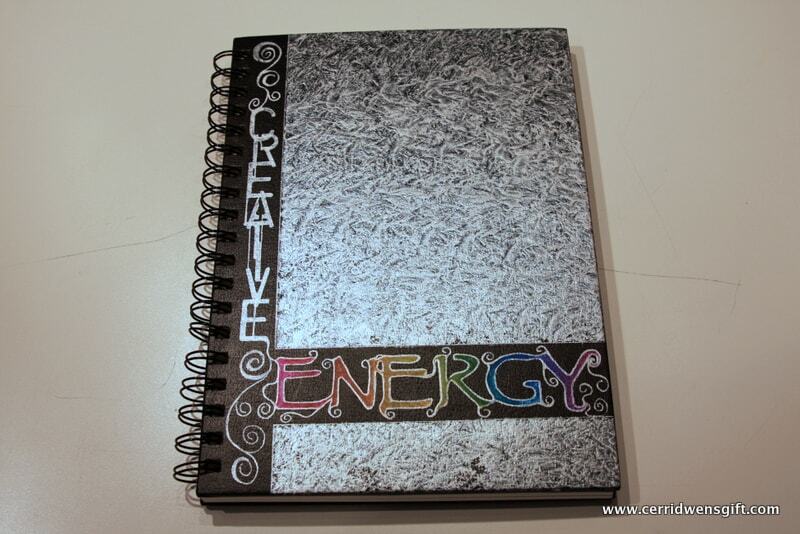 Some of you will use Creative Energy Journaling simply as a chance to relax and unwind. For some. Or it can be a way to encourage yourself to loosen up and be more adventurous in other creative work. And some of you may be journaling to transform yourself, become more fully yourself, getting in touch with your intuition, your dreams, your passion, living more authentically and powerfully. It’s fitting to take a little time to claim this journal as your own and honor the space in which that work will take place, a place where your creative energy will be cradled and unleashed. Although I’m inviting you to personalize your journal cover, please do not feel any pressure to do so if it feels better to you to keep a subdued, unobtrusive cover. Decorating and personalizing the cover of your journal can be an excellent way to honor and affirm your intention to do important and meaningful work within its pages, but if it feels better to you to leave it as it is, please follow your instincts. If you plan to work in your journal at a coffeeshop or in the park, you might prefer to “fly under the radar” so that you don’t invite questions from friends or passers-by, so don’t feel you must decorate your cover. Some people find it more inviting to have a very plain blank cover, so that they don’t feel influenced to make the contents of the book align with the style of the cover. In Invitation 2, I’ll suggest ways you can honor your journal that don’t change it appearance. Do what feels right to you. If you have an idea of what you’d like to do with your cover, have at it! If you need some suggestions, here are a few ideas to get you started. You can modify and embellish them to your heart’s content. You might choose to personalize the existing cover with ink, collage, paint, or by gluing on appealing or symbolic objects. If you want a blank surface to work on, here’s one simple (and removable) way to get one. If you are excited to get started, but thinking you want to do a more elaborate cover later, starting with the old-fashioned kraft paper cover that some of us used to have to put on our schoolbooks is a great way to give yourself a blank surface to decorate, without feeling like you’ll be stuck with it. Or, you can use some pretty paper, as I have in the examples, and either add to it later, or just enjoy it as is. If you’re the right age, you may remember making these in school. To make a blank cover, you’ll need a piece of brown kraft paper or a brown paper grocery bag (turn it so the store logo is on the inside). If you want something prettier, use a piece of wrapping paper or other decorative paper. Wallpaper remnants are also great for this. First cut a rectangle of paper long enough to wrap all the way around the cover, plus at least 3” on each end. Cut the paper to extend 1” beyond the top and bottom of the book. Cut your paper so that it extends 1″ beyond the top and bottom of your journal, and long enough to wrap all the way around, plus at least 3″ extra on each end. Fold in the top and bottom edges to fit the height of the book. Fold in top and bottom to height of book. Fold end flaps so that the unfolded portion will just wrap around the cover. Slide the back cover inside the upper and lower overlap folds on one end flap. Insert the back cover inside the upper and lower folds on one end flap. Wrap the cover all the way around and slide the front cover inside the upper and lower folds on the other end flap. Slide the other end of the cover onto the journal. You can add a bit of glue (or tape) to make the cover more secure, if you like. Put a little glue on the flap overlaps to secure the cover. Any sort of acrylic paint can be used to decorate both cardboard and clothbound journal covers. Art supply stores have acrylic paint, of course, but for this sort of thing, you can also use the “decorator” acrylic paints sold in hobby shops (and the art/hobby section of discount stores) used for stenciling walls, fabrics and household items. You can even use leftover latex wall paint. First a word about keeping acrylic paint off things you don’t want it on. Acrylic paint can be used to paint on almost anything, which means that it’s going to want to stay on almost anything once it’s dry. It’s also basically colored glue, so in addition to adding unwanted color to your favorite shirt, it can glue things together that you didn’t want glued. Fortunately, it doesn’t dry as fast as super-glue! But if you paint your journal cover in acrylic, and then put it down on a piece of paper to dry, you may come back to find the paint has oozed down the edges and glued your journal to the paper. Wearing old clothes solves one problem. Disposable latex or nitrile gloves (try the paint department of your hardware store) will keep your hands cleaner. Acrylic paint is not hazardous; just a nuisance to get out from under your nails. Freezer paper (shiny side up) is the easiest solution to protecting your work surface and keeping acrylic-painted things from gluing themselves where you don’t want them. Acrylic paint won’t bond to the shiny side. You can usually buy freezer paper in the grocery store or where supplies for preserving food are sold (here in the Midwest, Fleet Farm carries it in giant rolls). You can tape it down on your work surface and use it over and over. In the first example, I’ve just brushed on a mixture of blue and silver paint. I dipped my brush in the blue for some strokes and in the silver for others, and then went back and forth along the edges of the brushstrokes until I liked the way the colors blended. A cover painted in streaks of acrylic colors, blended a little with a brush. In the second example, I’ve borrowed from the faux-finishing techniques used for walls and furniture. To make a cover like this, first put down masking tape on any part of the cover you don’t want paint on. You can use an X-acto knife to cut out shapes, or just use the tape to make a geometric pattern. Put a blob of paint on your freezer paper, or in a shallow bowl or saucer. Scrunch up a piece of plastic wrap, dip it into the paint and smush it down on your freezer paper to test the pattern. Re-scrunch and experiment with how much paint you want to pick up and how you want to scrunch the plastic wrap until you like the pattern. Then stamp all over the cover of your journal. It looks most interesting if you don’t try to get complete coverage. Crumpled up plastic wrap or waxed paper works well to stamp an interesting pattern with paint. After stamping with iridescent acrylic paint. I used a lettering stencil to add some lettering to the cover. Stencils and stenciling sponges (or brushes) are used to put lettering and other decorative shapes on walls or furniture. They’re often sold in the same hobby shops/departments where acrylic paint is sold. After I stenciled on the letters, I added a little spiral doodling. Then I added some color to the lettering (more acrylic paint). I made a bit of a mess, so I went back and outlined the letters again. I used a dip pen, iridescent ink and a lettering template to add lettering. I could have used a stencilling sponge or brush—and it probably would have been easier! These are just a couple of ideas. I’ll share some more in a later post. Or, use your own imagination and experience—sewing, knitting, hot glue gun, leather tooling, woodworking. Or, keep it plain and simple. If you’re dying to get started working in your journal and don’t want to make a trip for supplies, you can always decorate (or add to) your journal cover later. I’m excited just imagining all the creative things you’ll come up with! I’m working on adding the ability for you to post pictures in the comments here, but until then, if you’d like to share your jazzed-up journal cover, you can post a picture to the Creative Energy Journaling Facebook page here. How is it going? Did you try a Crayon Conversation? Any questions about supplies or journals? Leave a comment by clicking the “Leave a Comment” button under the post title (or if you want to say something privately, you can use the “Contact” link in the top menu).